The way people treat animals often mirrors the way they will treat human beings. 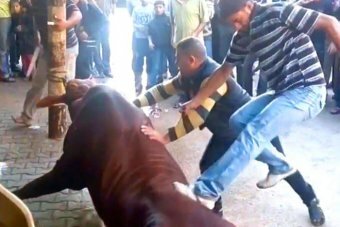 Extremely Disturbing Footage: Why are the animal rights activists silent? Yeah, bit like the continual bombing and atrocities perpetrated by Israeli against the Palestinians. What does this have to do with Israel? Look at the Middle East today, especially Syria. I'm sure most of the Syrians wished they lived in the West Bank or even under the Hamas and had to deal with Israel rather than with what is going on in Syria. Anyway let's stay on the subject. YES - I'm convinced, that it clearly shows how they would also treat human beings. This behavior is unjustifiable and inexcusable. It's just barbaric, shameful and degenerate and that is only one reason why I do not want to see those people and would not tolerate in my country! There is never an excuse for treating animals badly. The way you treat animals just shows who you are inside. HORRIBLE but not the only religions to practice it. The activists are out as I have signed several petitions on this festival as well as on other religious festivals.. Even the 'peaceful' religions like Buddhism, Christianity, Judaism and Hindu's , to name a few, have these yearly animal sacrifice rituals. Maybe not to the extent and numbers, but whether it's 70-80 goats (Christian) or roosters for the Jewish Korban it's still needless slaughter and outdated thinking. They need to come into the 21st century and realise that animals are sentient. Cruel Bastards.has been happening for years. Thank you for caring and sharing David. Deplorable and sickening Thank you for caring and sharing David. I have seen so many videos of these kinds of slaughters that I just can't handle it right now but Darren you're passing the buck. The people who are hurting animals in the video are fully responsible for their actions against animals who have no voice and have done nothing to them. Don't blame their treatment of animals on Israel. From this life to the next you must cross a bridge covered by every animal you have known and interacted with. You will be judged by how you treated the voiceless and helpless. Do you really believe that ANYONE engaged in WAR, trying to defeat an imagine enemy, is remotely interested in the WELFARE of animals, let alone the people they've bombing? If you want GENUINE Animal Welfare, vote the vegetarian, Dr. Jill Stein. Jill’s Stein responds during 2nd Presidential Election debate.